We are so excited to have Mary Carter sharing with us today (and not just because her holiday recipe is for a delicious-sounding martini!). This accomplished author is the third Mary in her family (and the second Mary Patricia), and she has certainly inherited the gift of storytelling through the family lines. She claims that her mother (a feisty redhead and the first Mary Patricia) is one of the best storytellers that she knows. A graduate of the American Academy of Dramatic Arts, as well as the National Technical Institute for the Deaf, Mary is currently working on yet another novel! "The Pub Across the Pond" is her fifth novel, in addition to two novellas. You can check out her updates at her website. Thanks to Kensington Books, we have one copy of "The Pub Across the Pond" to share with a lucky reader in the US or Canada. In Mary Carter’s newest novel of women’s fiction, THE PUB ACROSS THE POND, the author of MY SISTER'S VOICE and SUNNYSIDE BLUES invites readers to come on an exhilarating journey to Ireland, as one woman learns about luck, love, and finding the courage to listen to her heart. I love throwing little parties and the holidays are a perfect excuse. Last year I found a recipe online for a Candy Cane Martini and after a little tweaking, I made it for a girls’ night I threw at my place. It was a huge hit! You don’t have to make it with an official martini glass, but if you have one, with a little dressing, it looks spectacular. Rim the edge of the glass with lime, then coat the glass with sugar. In a strainer mix the vodka, pepper schnapps, and cranberry juice. Strain into the glass. If you want to get fancy, add a splash of champagne or orange Cointreau. 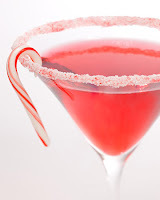 Hang a small candy cane over the side along with a wedge of lime, and in a few easy steps you have a holiday hit! For any non-drinkers in the crowd, you can make it non-alcoholic with seltzer, lime, and cranberry juice. I decided to share this drink recipe because anyone who saw my previous attempts at making Gingerbread Houses will quickly ascertain that I should stick to mixology. But even more so, I picked a cocktail in homage my latest novel, The Pub Across the Pond, in which an American woman wins a pub in Ireland. Although the little pub is used to their own ways of doing things, my heroine, Carlene Rivers, brings in a few ideas of her own. And although she doesn’t exactly serve up Candy Cane Martinis, if there’s ever a sequel, I can certainly see a few of the regulars grudgingly giving it a try. Happy Holidays to you and yours, and cheers—or slanté—as they say in Ireland. Special thanks to Mary for sharing this delicious sounding drink recipe and to Kensington Books for sharing "The Pub Across the Pond" with one of our readers. 1. Please tell us: What is your "must-have" item for a party (holiday or any other kind)? US/Canada only. Giveaway ends January 2nd at midnight EST. What is your "must-have" item for a party (holiday or any other kind)? BOOMBOX of course, the party doesn't start unless there's some party music. sent join request for Facebook group. I would enjoy reading this one! Hmmm....my must-have item would be my hubby, LOL! It sounds funny, but even if I don't talk to him all night I have a better time just knowing that he's there. I am a CLC group member. Mine are my table cloths, napkins etc. My Mom collected quite a few for every occasion and I now have inherited them and lovethem. They really are beautiful. I am a follower. My must-have item for a party is ginger ale. You can mix it with pretty much anything! My must-have item is music. Must Have items for me are a cheese and sausage tray, and a great dessert something with chocolate! Must have item...since I don't drink, sodas. My must have for a Christmas party would be Egg Nog, Bordens is the best. Already Joined Chick Lit Central on facebook. I added friend Lori Pace. My must-have is a good playlist. Second to that would be a nice-smelling candle in the powder room. We don't really give a lot of parties and the only thing I can think of that we always have at every party is soda. Must have item for a party : Music! 1. I'm not very creative in the kitchen but I do make an AH-MAZING mexican dip! I make it or bring it for every party! My must have for any party is cake balls. They are a hit with everyon! I reposted this on Twitter and tagged you. I also sent a request to be in your Facebook group. I'm a member of CLC! This has been on my to-read list!